We don’t have to tell you that to be successful, you need to take care of your customers. We’ve all heard the perks and seen the studies that show how excellent customer service translates into customer retention and converts customers into brand advocates. The question really isn’t why creating a positive customer experience is worth your time but rather how you can make it happen. Cloud phone systems allow users to integrate their phone system with their Customer Relationship Management (CRM) software which will give your company an added advantage when it comes to customer service. Call tracking and pop-up notepads can elevate your employee interaction with customers by automatically pulling up customer profiles when they call in instead of manually going into the CRM and pulling up info. Skip the step where you ask for a name or account number and leverage this feature to create personalized greetings and inquiries that a customer won’t expect, but will appreciate. 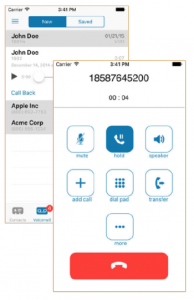 Beyond CRM integration, cloud phone systems have other features to help you optimize your call center. 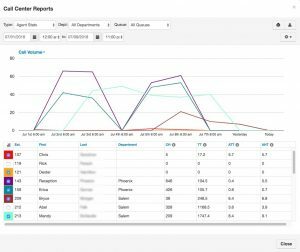 First off, the system generates call reports with actionable analytics that gives you information on things like peak volume, abandoned calls, statistics by agent and other insights to help with strategic staffing decisions. This allows you to manage long queues, minimize customer wait time and make sure you are meeting customer demand. Your cloud phone system will make sure you never miss a call using the find-me-follow-me feature in conjunction with the softphone capabilities. Find-me-follow-me allows calls to be routed to more than one phone sequentially or simultaneously. This means that the same call can go to multiple devices whether that be a specific agent’s office phone, cell phone and tablet or a group of agents that are all equipped to answer the call. Employees can be available from wherever they are or can share incoming calls to make sure someone is always available to support your customer. A cloud phone system can help you design a unique, effective and seamless customer service experience. This is the technology for you if you’re looking to up your game quickly and easily. If you’re interested in elevating your call center and improving your customer experience click here to learn more or give us a call at +1-800-497-5570.